Your Compliance Partners in Microbiology. Choose from five pre-assembled kits for ease of use or create your own aseptic technique challenge with our à la carte line of HardyVal media and products. HardyVAL a la carte products make it easy to customize media fill challenge tests to your unique specifications. A la Carte components come in an array of unique formats such as vials, bags, ampoules, and tubes. All HardyVAL components are manufactured in an ISO 13485 certified GMP facility. Culture media is quality control tested for growth promotion, pH, and sterility. Media Bag™ by Hardy Diagnostics is ideal for verifying aseptic technique of pharmacists, nurses, or pharmaceutical manufacturing technicians. Available in both 100ml fills as well as larger 700ml fill bags. Media Bag™ has both a needle-port and spike port, is terminally autoclaved for high sterility assurance, and features a suspension port on the top allowing the technician to hang the bag. The Next Generation of Air Samplers. Available with one, two, or three aspirating heads. The Trio Bas Trio (three heads) has the ability to sample before, during, and after operations. Battery life lasts up to 15 hours on a single charge. Ergonomic – balanced, light weight, easy-to-hold and use. Aspirating head with quick bayonet fixing system for easy manipulation. Available in 100 or 200 liter per minute flow rate models, and contact plate or mono plate formats. No plugs or external connections* – reduce the risk of contamination. *The Mini utilizes a wall charger and data transfer cable formats. Added measure to ensure sterility in your environmental monitoring program! Tryptic Soy Agar (TSA) with Lecithin and Tween®, USP is recommended for use as a general growth medium for establishing microbiological trends, alerts and action levels in biologically controlled environments. 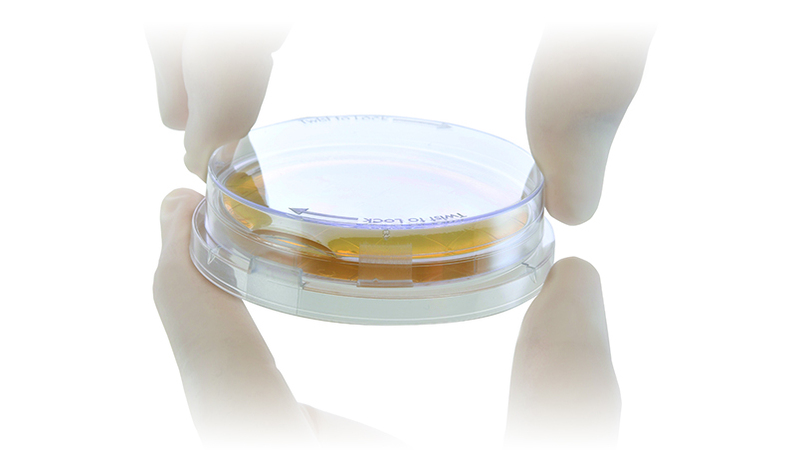 Lok-Tight™ Contact Media Plates features a friction lid design that keeps the lid in place aas well as an optional locking feature, and molded grid in the bottom of the plate to aid in the counting of microorganisms. Environmental Monitoring has never been so flexible! 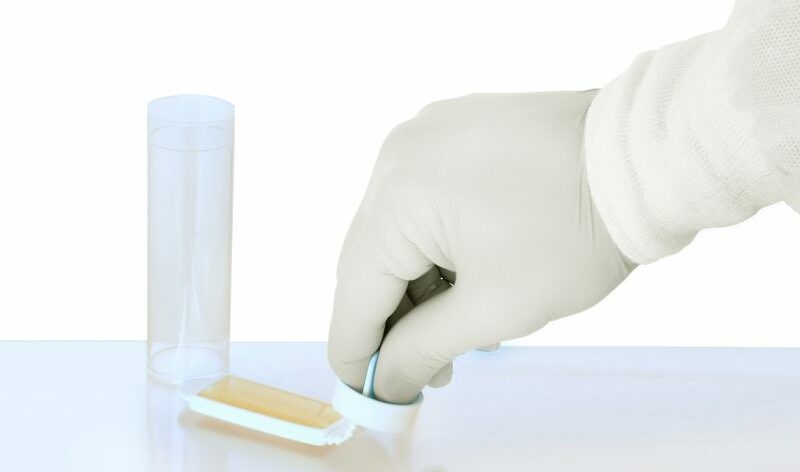 TSA (Tryptic Soy Agar) Media Paddles support the growth of a wide range of microorganisms. These flexible, hinged paddles can bend 90 degrees, are dual sided, and are quality tested for pH, performance, and sterility. Designed for sterility sampling. Acting as a sterile barrier, the Sterisart® Septum allows for a safe, aseptic sample transfer out of a closed, sterile system. This enables you to take samples whenever needed or to transfer samples into a rapid detection system after only a few days of incubation- secure and flexible method. Bring media into a controlled area while avoiding outside contamination. The ReadyRack™ is a plastic rack designed for cleanroom use and can be rinsed with alcohol. The ReadyRack™ comes filled with 80 tubes of Tryptic Soy Broth (TSB), USP or Fluid Thioglycollate Medium (FTM), USP. Simply remove ReadyRack™ from the box outside of cleanroom. Take into cleanroom and remove the plastic bag. Spray down entire ReadyRack™ with isopropyl alcohol, and allow to dry. Holes in the bottom of the rack allow for sterilant to drain. Convenient hand-holds to easily transport product. No cardboard for low particle counts.